Three-time Champions League and EHF Cup winners THW Kiel had a hard nut to crack in their first ever EHF Cup Group Match on home ground. It was three late strikes from Domagoj Duvnjak in the Round 2 opener against Azoty-Pulawy that prevented the German side from their first home defeat ever in this competition. It was a much tougher challenge than expected, but THW Kiel ultimately kept their unbeaten record, recording what was their 18thstraight home victory in the EHF Cup since 1998. In contrast to their opening defeat against GOG, Pulawy started well, even coping with an early 2:4 deficit. Thanks to their improving defence, the side of head coach Bartosz Jurecki turned the match around and quietened the more than 7,500 fans in Sparkassen-Arena, extending their lead to 10:7 in minute 24. 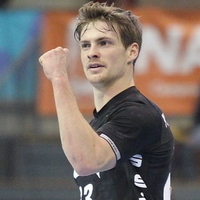 This goal was something like a wake-up call, mainly for Danish left wing and world champion Magnus Landin. The brother of goalkeeper Niklas headlined the match with six counter attack strikes and wing goals before minute 42. This period, from 7:10 to 20:14, was the crucial one, with Kiel conceding only four goals in 20 minutes. Thanks to a series of saves by goalkeeper Andreas Wolff, the German team took full control on the match, as Pulawy were blocked by the intense defence led by newly crowned German Handball Player of the Year 2018, Patrick Wiencek. But due to this clear six-goal advantage, Kiel lost their rhythm and concentration, allowing the visitors to score a series of five unanswered goals for 20:21. Even a timeout from coach Alfred Gislason did not stop Kiel’s downswing. From Wiencek’s strike for the 20:14 in minute 44, THW did not score a field goal until minute 57, when captain Duvnjak netted for 23:21. Pulawy’s Pawel Podsialo was on fire in the dying minutes of this thriller and always had an answer to Kiel’s strikes. But after Gislason’s final timeout 44 seconds before the end, at 24:23, Miha Zarabec and Duvnjak secured the close, but deserved win for the home side. Kiel will continue their EHF Cup campaign on home ground against GOG, while Azoty-Pulawy will host Fraikin Granollers in Round 3.